By The Book is my third novel and has been released only to e-book except by special order. They’ve never gone on a quest. They’ve never done anything that wasn’t in The Book. God appears in Paul’s kitchen during breakfast and sends Paul on a quest. The quest begins by taking the first person he meets as his companion. Daniel comes by to trade for vegetable and begins a Tuesday that ends with them on the road away from their home with only a Page from Paul’s Book to guide them. Paul and Daniel learn very quickly that the world is bigger and stranger than anything they’d known before. Only as they starting succeeding in their quest do the friends realize they are fighting an ancient and powerful evil. If they win, their world will never be the same. If they lose, all hope of love and beauty may be lost. Imagine that Adam and Eve not only refused to eat the forbidden fruit, but pestered God morning and night to tell them what to do so they would displease God. Imagine they were given Books to follow so they would never anger God. Imagine if those Books were wrong. Paul didn’t notice that God came to visit because he was concentrating on fixing breakfast according to the Book. It was Tuesday, that’s why he made oatmeal. He used exactly the prescribed single measure, stirred carefully to avoid lumps as it cooked to just barely thick enough to stand a spoon in. He scraped the glutenous mess into his bowl and poured in the proper measure of milk. Only as he started to eat, did he notice God waiting patiently in the doorway. Paul had heard of such things before. His great-grandfather Enoch claimed to walk with God on a daily basis. Paul had to make do with the Book. He flipped the immense leather bound volume open to the “Visitation by God” page marked by a yellow bookmark and began to follow the instructions. “Welcome, O God,” he said. His voice didn’t quiver at all, though his heart raced in his chest. “Tell what I may do so you will not be displeased with your servant.” An odd expression crossed God’s face, but Paul didn’t quite catch it since he was reading the next instruction in the Book. “Please,” Paul said, “Sit and join me at my feast.” A bowl of rapidly cooling oatmeal and milk didn’t seem like much of a feast, but it was the breakfast for Tuesday. God had to be pleased with how well he was following the Book. God sighed and sat across from him. Paul sighed and started spooning the oatmeal into his mouth. Since it counted as a soft food he was only required to chew it ten times. He didn’t much like oatmeal either, but what else would you eat on Tuesday?. Somehow, having God watch him eat made the oatmeal even more tasteless. When he had finished breakfast, he looked up to see if God was still there. He was. He didn’t look much like Paul expected. God should be immense and powerful, much too big to fit in Paul’s humble kitchen. But here he was dressed in a dusty robe and not shining at all. In fact he appeared a little tired. “What do you require of me?” Paul asked after looking in his Book again. Why the question changed from one asking to the next didn’t bother Paul. It was in the Book. As long as he followed the Book, God wouldn’t be displeased with him. “A quest is a special kind of journey,” God said. Paul thought there might be a slight edge of irritation in God’s voice. He felt the oatmeal sit like a lump in his stomach. He was displeasing God! In a moment God would smite him with a lightning bolt, or maybe fire and brimstone. Paul tried to relax, but he was sure he wasn’t doing very well at it. He turned to the Book, maybe there was something on relaxing there. God, very gently, reached over and closed the Book. “You will take the first person you meet today as your companion. The two of you will share the quest and learn from each other.” He stood up and Paul was sure he was going to leave. There was something that he needed to do when God left. He was sure of it, but God had closed the Book, and Paul did not plan to open the book that God shut. 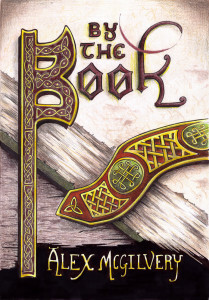 Paul opened the Book to the place with the yellow bookmark and found a blank page. He turned to another page and it was blank too, so was the next, and the next after that. The entire Book was blank! He looked at God. “How will I know how to please you if I don’t have the Book?” This time his voice quivered. Paul reached out with trembling hands and tore a page out of the Book. God reached over and touched the paper with a finger. “When you need guidance,” God said, “it will direct you.” Paul looked at him and for a moment he saw something vaster than anything he had ever imagined. Then God had gone, and he stood alone in his kitchen. He looked down at the page in his hand. Paul hadn’t realized he was standing. He sat carefully in his chair and took a deep breath, then another. How many was a few? Three, four? Paul sat on his chair and breathed until he stopped shaking. Paul got up and washed his bowl and spoon, carefully wiping them each three times. He washed the pot too and set it upside down on the stove. Once he finished it was time for him to go and look after his garden. He meticulously weeded the small plot of land that grew most of what he ate. The feel and smell of the dirt almost made him forget about God’s visit and the quest. There were peas and lettuce and even a tomato that were ripe. He picked them and carried his harvest into the kitchen. When he completed the weeding he went out to the pasture to look after his sheep. The ewe provided him with fleece to trade and milk for his oatmeal. It wasn’t time to sheer her, but he milked her and put the milk aside while he made sure that she was healthy and uninjured. First he examined her head and eyes. His fingers travelled down her neck, then down each leg. He lifted each foot in sequence to check her feet. Then he checked her back and stomach, then hind legs and feet. She smelled like she was supposed to – earthy and like wet wool. The ewe simply stood and chewed at some grass. She was used to this. Paul did it every Tuesday. After he checked his ewe, he made a count of the other sheep in the pasture. There were fourteen. All was well. He picked up the milk and started walking back to his home. God said that he was to take the first person he met. Maybe it would be Diana! She would have to come with him. It would be a long and dangerous journey and they would have to become close companions. She might even learn to like him. Paul was lost in his daydream when he heard a voice hail him. “Come to the house,” Paul said in a despondent voice. He saw Daniel give him an odd look. “How could Tuesday be Friday?” Paul said. “I follow the Book,” Paul said and walked a little faster. “Sorry,” Paul said. Of course Daniel had his own copy and would know it as well as he did. Didn’t every person find the Book when they were old enough to read? No one knew where they came from, even the Book said little about the Book. Each person’s Book was subtly different. Paul’s Book made him a gardener and shepherd while Daniel’s Book made him raise chickens. Paul wondered briefly if Daniel’s Book said the same things about welcoming God as Paul’s did. He was sure it did. All the Books came with that yellow marker so they could turn to it as soon as God appeared. It was just that God didn’t show up very often. They reached Paul’s home and went inside. Daniel went to the vegetables and began picking out what he wanted. Paul looked at the Page. He was already thinking of it in the capitals he usually reserved for the Book. “Uh, Daniel,” Paul said. Daniel turned and looked at him. How was Paul supposed to tell him that he was supposed to be Paul’s companion on the quest? What if he didn’t believe him? He peeked at The Page. “I’m going on a quest.” Paul said. “What’s a quest?” Daniel asked. That was strange, Paul thought, because it was true. Not many people liked oatmeal. Yet everybody ate oatmeal on Tuesday. Oops, he was getting The Page angry. Daniel walked over to the big book and flipped it open. His eyes widened when he saw that it was blank. “God gave me this for the quest,” Paul said and showed him the page. Daniel, you will go with Paul. Pack one bag. Put one set of extra clothes in. Pack food for a week. Wear your cloak. “Sure,” Paul said. He didn’t watch Daniel leave. He pulled out a few bags. Take the strongest. Leave space for some cheese. Paul decided the strongest was the next to biggest bag. He looked at the page, but it hadn’t changed. Rolling up his spare clothes as tight as he could get them, he stuffed them in the bag. Then carefully measured out the food for the week, and packed it too. His sheepskin cloak was heavy, but it was a familiar weight on his shoulders. There was space for cheese. “What’s going to happen to my home and my garden and my sheep?” Paul asked as he hefted the bag. Go get your cheese. Give everything but your bag to the first person you meet. Paul shrugged. If the Page said so. He was going to miss his things though. He put the bag over his shoulder and headed off toward Diana’s. In his free hand he carried the vegetables and eggs that he hadn’t packed. It was odd how the familiar path suddenly became charged with meaning. He noted each landmark, each stone or root. He wouldn’t be passing this way again, or at least not soon. Yet even as he nodded at each turn in the path, his heart was pounding with excitement. God had come to him! He rounded the last bend before Diana’s father’s house and almost bumped into Zaccheus. He wondered why the richest man in town needed his home and sheep, but that’s what the Page said. “Do you not trust the Book?” Zaccheus frowned at Paul. “Yes, of course.” Paul thought of his Book, sitting blank in his kitchen. “Yes, of course,” Paul said, “but…” The page in his hand rustled and he looked at it. “What is that?” Zaccheus pointed at the Page. “God gave it to you?” Zaccheus reached for the page. Paul reluctantly let him take it. The Books were the final arbiters of any conflict. This wasn’t really a conflict, and it wasn’t quite a Book any more, but it was the way things were. Zaccheus looked at the page and went pale. He pushed it back into Paul’s hands and went up the path almost at a run. Paul didn’t know why the cheese was so important, but he was glad enough to see Diana. He hurried down the path. Now that he owned nothing but what he carried, the bag on his shoulder felt very light. Diana lived with her father. They made cheese from milk they traded for. The only thing that Paul liked more than the cheese was Diana. When she came to the door Paul couldn’t help staring at her one last time. She was only slightly shorter than he was, but he was sure she was just as strong. In spite of her strength she looked soft and curvaceous. Her hair braided fell to her waist. She frowned at Paul. “Come in,” she said. As he walked into her home he saw her go to her Book and flip it open. Whatever it said made her gasp and put her hand to her mouth. Paul wondered if being sent on a quest was such a blessing after all. “Come,” Diana said and led him to the cool, dark room where the cheeses were stored. Paul put the bag with the vegetables and eggs on the table and his sack on the floor then followed her. In the room she picked up a small round of cheese and wrapped it in a cloth then handed it to Paul. He packed it carefully in his pack. This was the last thing he needed before he left. He thought he’d go over to Daniel’s and make sure his companion was ready. Paul was unprepared for Diana to throw her arms around him and kiss him, but he made the best of it, trying to lock the memory into his head so he could bring it out to think about while he traveled. “The Book said to kiss you goodbye if I ever wanted to see you again,” Diana said into his shoulder. Paul felt something in him relax. He would live. He’d come back and see Diana again. “Did it say just one kiss?” he asked. She looked up at him with a smile. “No,” she said. The second kiss was even better than the first. Paul let his sack drop to the floor so he could use both arms to hold her. “I hope you didn’t crack the eggs.” Daniel leaned against the doorpost of Diana’s home. He held a stack with one hand. Diana stepped back. She was still smiling, but tears were running down her face too. Paul picked up his sack. “You have to come back now,” Diana said. He walked out of the house and he could hear Daniel following him. “The Book didn’t arrange for me to get any farewell kisses,” Daniel said, but he sounded more amused than jealous. Paul looked at the Page. For the first time in his life, Paul left Eben, his home.